Thanks to the wonders of podcasting, you no longer have to become a media mogul to be heard far and wide. With some basic equipment and our Podcasting guide, you can simply record broadcasts on your Mac and publish them to the Internet for others to download. But keeping your audience interested isn’t so easy. Bad audio, awkward pauses, and boring dialog will have even adventurous listeners reaching for the Stop button. 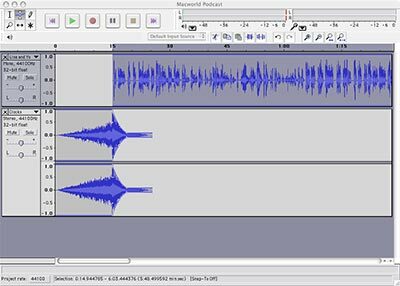 To make your recording as smooth and entertaining as possible, spend some time polishing it with audio editing software such as Audacity (free). 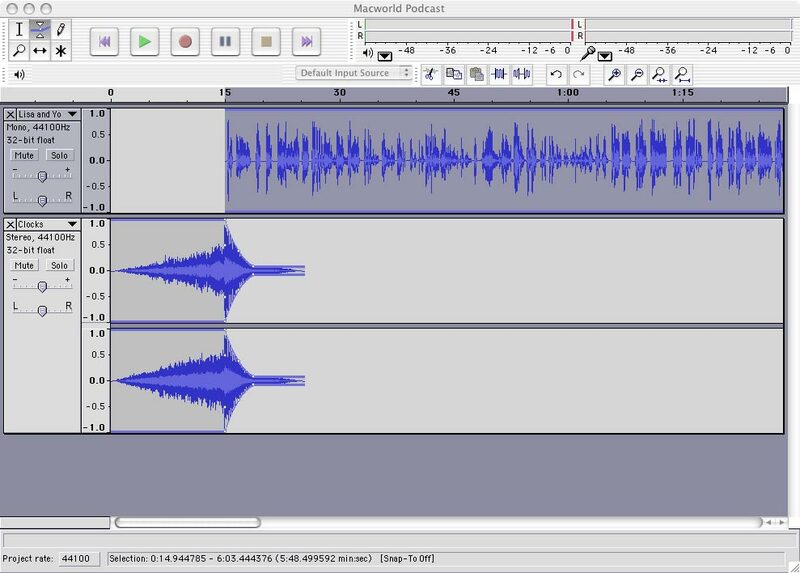 You can use Audacity to combine multiple takes, getting the best from each; to delete awkward pauses; or to add embellishments. To get started, open the Project menu, select Import Audio, and use the file browser to find your saved audio file. Repeat this process for any other sound files you want to mix into your podcast—for example, a royalty free MP3 file that you’ve found or sound effects. Once the files are imported, weed out any awkward pauses or flubs by highlighting the relevant sections of waveforms and pressing delete. To add some interest to your podcast, and help give it its own identity, consider adding intro music. (You can use this technique to add sound anywhere in your podcast—don’t feel constrained by convention.) For example, here’s how to create a musical intro that fades in, plays for a few seconds, and then fades out again as the voice narration begins. Start with both tracks open in Audacity and trimmed down to their relevant parts. The top track should contain your podcast narration, while the bottom track contains your intro music. To create a fade, highlight the first couple of second of your intro music and choose Effect: Fade In. Next you’ll want to drop the volume level at the end of the music track so it fades softly as it overlaps with the beginning of your voice track. Select the Envelope tool (it looks like a blue line with arrows) from the toolbar in the upper lefthand corner. Click on the upper edge of the music track’s waveform at the point where you want the fade to begin. Then make another mark at the end of the intro. You can now click on and drag the blue envelope marks in your waveform to define the speed and duration of the fade. Move the second set of marks downward and inward to have the music immediate drop off once your voice narration begins. For a smoother transition, and to have the music play softly under your narration, move the marks farther out. You can also use the Envelope tool to add more marks to further shape the volume curve. The last thing you need to do is adjust the narration track so it begins at the appropriate moment. Select the Time Shift Tool (the double-pointed arrow) then click-and-drag the narration track so that it lines up with the spot in your intro music where you want it to begin—for example, where the music begins to fade out. Once you’re satisfied that you have all the sound elements mixed properly, export the file as a WAV or AIFF file. (Audacity unfortunately can’t export directly to MP3.) To set your export preference, open Audacity’s File Formats preferences and select the appropriate option from the Uncompressed Export Format menu. Then you can open that file in iTunes and convert it to an MP3 from there.